The 364 day bill weighted average was seen increasing for the first time in eleven weeks at its auction conducted yesterday recording a 08 basis point jump to 9.05% closely followed by the 91 day bill by 07 basis points to 8.07%. The 182 day bill was not on offer for a third consecutive week. The total offered amount of Rs. 16.5 billion was fully accepted as the bid to offer ratio dipped to an eleven week low of 1.79:1 as well. Secondary market bond yields were seen increasing for a fourth consecutive day, spiking as much as 20 basis points on certain maturities driven by continued selling interest. Yields on the liquid maturities of 15.07.23 and 01.09.28 increased to intraday highs of 10.25% and 10.55% respectively against its previous day’s closings of 10.02/08 and 10.40/45. In addition, 2021s and 01.08.24 changed hands at levels of 9.61% to 9.82% and 10.21% respectively as well. Furthermore, the 364 day bill was quoted at 9.10/20 in the secondary market post auction. 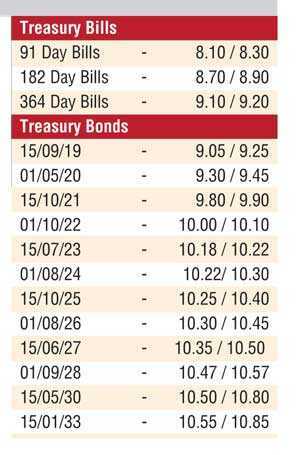 The total secondary market Treasury bond/bill transacted volumes for 11 September was Rs. 9.25 billion. The liquidity in the money market was seen turning negative for the first time in two months yesterday recording a net deficit of Rs. 3.53 billion. The Open Market Operations (OMO) Department of the Central Bank of Sri Lanka infused liquidity on an overnight basis to the tune of Rs. 12.36 billion at a weighted average of 7.93% subsequent to offering Rs. 20 billion. An amount of Rs. 12.50 billion was injected on a 14-day term basis as well at a weighted average of 7.97%. Overnight call money and repo remained broadly steady to average 7.93% and 8.00% respectively. The USD/LKR rate on spot contracts closed the day marginally lower at Rs. 162.40/60 against its previous day’s closing of Rs. 162.30/40 on the back of renewed importer demand. The total USD/LKR traded volume for 11 September was $ 85.47 million. Given are some forward USD/LKR rates that prevailed in the market: one month – 163.25/55; three months – 164.95/25; six months – 167.40/70.